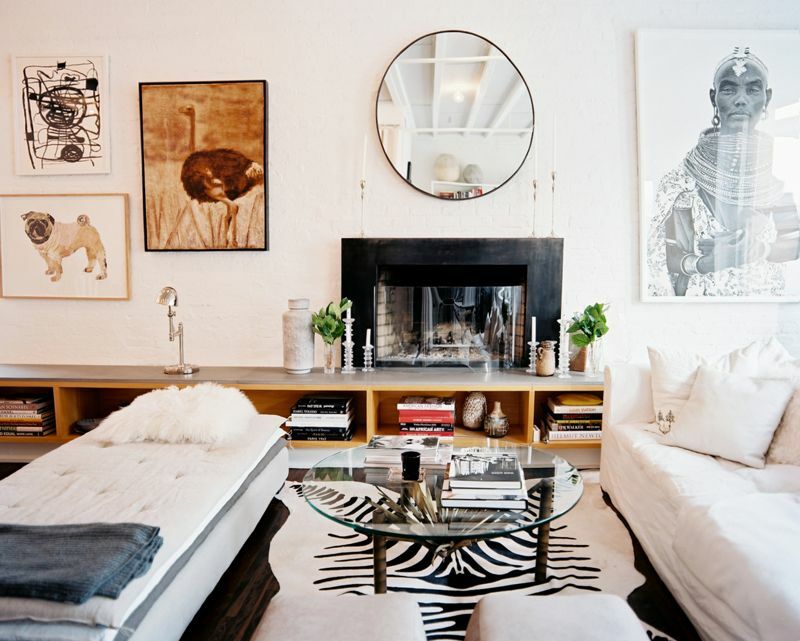 The living room of former Domino editor, Sara Ruffin Costello, has been a longtime favorite of mine. And when it came to planning my sister's awkwardly laid-out living room with its off-centered fireplace, the layout of Costello's room immediately popped into mind. 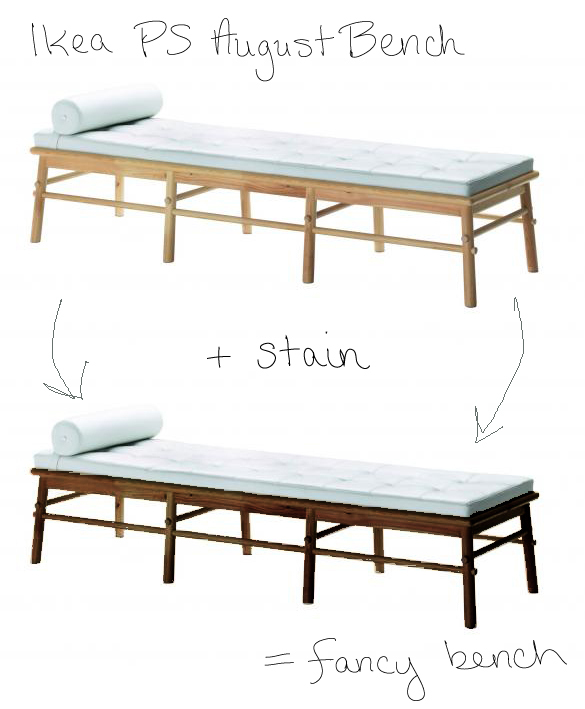 The solution seemed to lie in a single piece of furniture: the flat daybed. Because it doesn't have a backrest, it keeps the room open rather than breaking it up, and it allows for either two seating areas or one large grouping. In my search for an affordable option, it seems most flat daybeds are the designer's own version of Ludwig Mies van der Rohe's famous Barcelona daybed, complete with bolster headrest. And while most cost upwards of $1000 (the Barcelona topping the list at a steep $8k), I discovered that one of Ikea's newer "designer" items is a white, leather daybed retailing for $499. Perfect. My sister and her husband aren't huge fans of light wood, so with a quick Photoshop fix, we can see what the PS August bench looks like with darker wood. Très joli, oui? Oh wow, I love it! That would be perfect in our awkward living room too!!! Love this bench, had no idea Ikea had such a thing! Look at Ikea stepping up its game! Really looking forward to seeing the finished space! I've never commented before, but I love your blog. I was searching for something similar for my mom and I just HAD to show you this bench I found on Overstock.com. It's almost identical and very reasonably priced! Sara's living room has also been a favorite of mine too. Its bright & cheery while still being super classy. 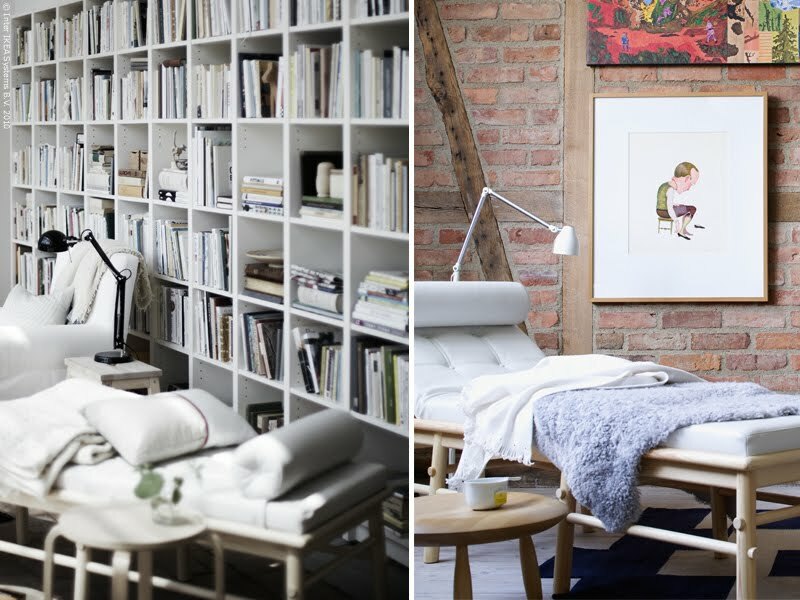 I love it ... great inspiration for you sister's place! This is why I want daughters. The Moroccan Pouf: Fad or Investment Piece?